Happy New Year! I hope you had a fantastic holiday season. I wish you happiness, comfort, peace, good cheer and sweet surprises to you and all your loved ones, throughout the year and always. Let's start the year off with this month's calendars and wallpapers! They feature some of the always so lovely hand drawn cliparts from The Ink Nest. Hope you'll enjoy them! P.S. : The calendar was all wrong when I published this post a few hours ago. It's fixed now. So sorry about that and thanks so much Nicole T. for letting me know! i look forward to these every month! I love using them! Oops, you're right, the calendar is all wrong! Thanks so much for letting me know. I'll fix this right away! Love them! Thanks for sharing girl! Beautiful! I love your monthly desktop calendar wallpapers! I especially love this one because of the adorble rabbit in the corner! Thanks so much for sharing! I love your wallpapers. I've been using them for the past 3 months now :) They always cheer me up as I work :) Thank you and happy new year! Happy new year! Health and joy and smiles and dreams! These are so pretty! And what a great phrase to start the year off with. I always look forward to seeing what you create next! They're actually the only wallpapers I use right now. :) Thanks for sharing! Thank you for your monthly calendars! 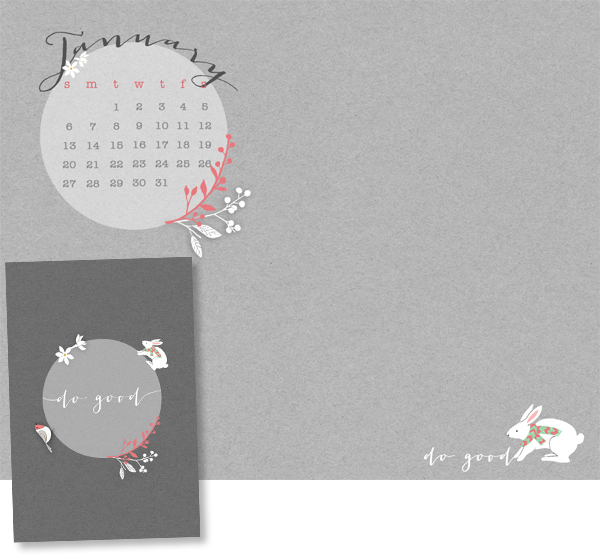 I enjoy seeing what new design you create each month and using them on my desktop! Thank you so much for your kind words and comments! I'm so glad you enjoy them!